Title: 05/03/1989 - HCS requirements applicable to oil and gas producers. This is in further response to your letter of March 6, addressed to former Assistant Secretary John A. Pendergrass, on behalf of your constituent, Mr. Tom M. Oly, Eagle Resources, Inc., regarding the Occupational Safety and Health Administration's (OSHA) Hazard Communication Standard (HCS), 29 CFR 1910.1200. 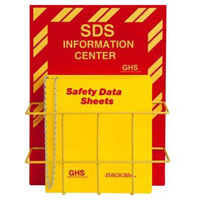 As employers covered by the expanded standard, which took effect for employers on August 1, 1987, oil and gas producers are required to maintain copies of materials safety data sheets for each hazardous chemical in the workplace and shall ensure that they are readily accessible during each work shift to employees when they are in their work area(s). Crude oil and natural gas meet the standard's definition of hazardous chemicals posing physical and health hazards to exposed individuals. Therefore, oil and gas producers are required to have a material safety data sheet for these substances, as well as for all other hazardous chemicals at your constituent's job sites. Under the current rule, a "generic" material safety data sheet may address a group of complex mixtures, such as crude oil, which have similar hazards and characteristics because their chemical ingredients are essentially the same, even though the specific composition varies from mixture to mixture. Evidence presented during our rulemaking proceeding indicates that availability of hazard information benefits both employers and employees. Employers are required to provide a safe and healthful workplace for employees, and will be able to do a better job when they have information about the potential hazards. Employees will be better able to take steps to protect themselves when they know what the hazards are and how to avoid exposure. The result will be a reduction in chemically-related occupational illnesses and injuries. It is important to note that OSHA is undergoing further rulemaking to gather additional public comment and information regarding the Hazard Communication Standard's application to the non-manufacturing sector. Among many others, your constituent's national trade association, the Independent Petroleum Association of America, participated in the process and, on December 14, 1987, testified on this issue at public hearings provided by OSHA. A final determination on whether to modify the current rule on this or other issues as a result of the rulemaking record is presently expected in July 1989. Therefore, your constituent's obligations may be affected if changes are made to the standard. OSHA has developed a number of resources to assist employers in complying with the HCS. A kit produced to OSHA is available that provides step-by-step guidance on complying with the requirements of the standard and serves equally well the needs of all employers, regardless of the industry in which they operate. The kit may be purchased through the Superintendent of Documents, U.S. Government Printing Office, Washington, D.C., 20402-9325 at a cost of $18.00. It has a GPO Order No. 929-022-00000-9 and is OSHA 3104, Hazard Communication Kit. It may be ordered by telephone from GPO by calling (202) 783-3238 and using a credit card. In addition, a booklet entitled, "Chemical Hazard Communication" (copy enclosed) provides employers with an easy-to-read explanation of the responsibilities of employers under the HCS. The booklet also contains a directory of all OSHA Regional and Area Offices. Employers may contact a Regional or Area Office for additional information or assistance. We hope this information is helpful to you. If we can be of further assistance, please feel free to contact us.